. 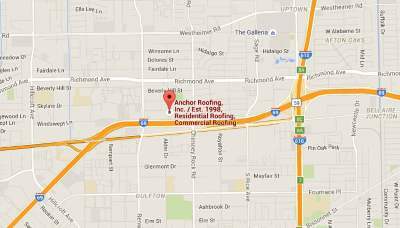 Our Locations | Anchor Roofing, Inc.
Anchor Roofing Inc. is a Houston, Texas residential, and commercial roofing company. Although we are located in Houston, we also serve surrounding Houston area. We offer a wide range of residential and commercial roofing services for homeowners and business owners. If your property requires top-quality Houston roofing service, then Anchor Roofing Inc. is the right roofing contractor for you. We offer construction of roofs, roof replacement, roof inspection, and roof maintenance carried out by top Houston roofing contractors. Our team is insured, licensed and trained to tackle every roofing project with great attention to detail and safety. Knowing that our team is on the project is insurance that you will be left with perfect roofing system. If you wish to hire best Houston roofing company, then give us a call as soon as you can. We care about you and your roof. Our professional team will make sure that your property is completely safe and secure from the outside weather conditions. We will sit down with you and go through every detail to make sure that we are on the same page and that we can understand what your expectations are. We offer great storm damage repair service for all homeowners as well as business owners. We will provide you with license and insurance paperwork in order to show you that we are trusted and legitimate business. There are many roofing companies operating without an insurance and/or license. Our professional team has seen it all. That means that they will be ready for any project we face. We will help you from simple repairs to roof construction and replacement. No project is too big or too small for our Houston roofing team. If your residential or commercial roofing system wasn’t inspected in some time, contact Anchor Roofing, Inc. and we will take care of all your roofing problems. Anchor Roofing Inc. is located in Houston, Texas and this allows us to easily access Houston area and neighboring communities. Our contractors install, replace, and repair roofs in the Houston, TX area, including Katy, Sugarland, Missouri City, Pearland, Spring, Cypress, Galena Park, Richmond, Rosenberg, Stafford, The Woodlands, Baytown, Clear Lake, Galveston, La Marque, Pasadena, Deer Park, Sealy, La Porte, Brookshire, and Columbus. If you don’t see your city listed above, don’t worry. Pick up the phone and call us to learn about our Houston service area. We are more than happy to discuss your potential service options.